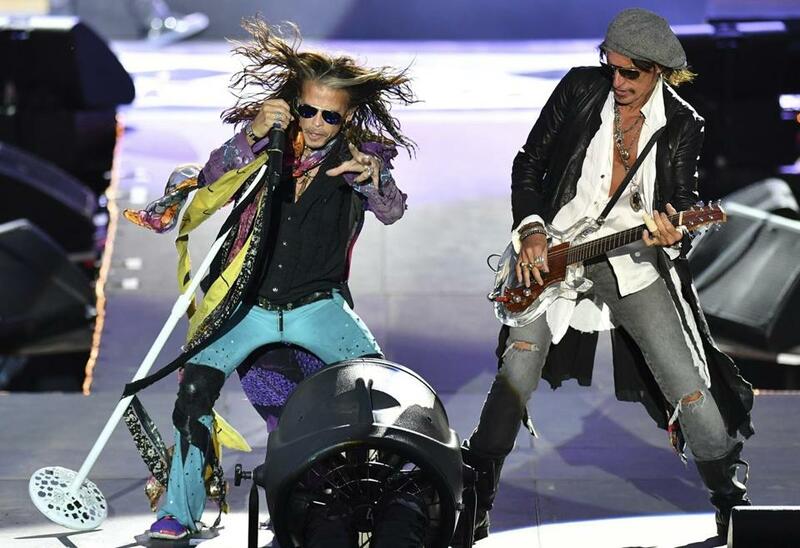 Steven Tyler and guitarist Joe Perry (shown in Germany last year) joined the rest of their Aerosmith bandmates at the New Orleans Jazz & Heritage Festival on Saturday. NEW ORLEANS — Each year, the New Orleans Jazz & Heritage Festival presents a wide-ranging lineup that salutes the roots — and the future — of American music over two weekends. On Saturday, the New Orleans Fair Grounds’ many stages hosted sets by soul belter Anita Baker, Latin rock alchemist Juanes, the well-traveled bandleader Deacon John, and representatives from jazz, gospel, blues, and funk, as well as a slew of other genres. But the headliner on the main stage represented Boston, and did so in winning fashion: Aerosmith, playing its first public concert since canceling a tour last September, returned from its hiatus with a roaring set. Jazz Fest often features rock artists; this year’s roster includes new-guard leaders like Beck and Jack White as well as stalwarts like Sting and David Byrne. But Aerosmith is a particularly good fit for the occasion, what with its bloozy origins and eagerness to pay homage to those artists that came before. The band’s afternoon-closing set started 15 minutes early, which was as much of a sign that they were raring to go as the reports that frontman Steven Tyler had been popping up around the Big Easy to surprise barflies with impromptu performances. Opening with “Toys in the Attic,” the title track of their 1975 album, the band was in fine form, with Tyler’s yelp leading his bandmates’ insistent chug as the crowd packed in more tightly. From there, Aerosmith ran through a 14-song set with a couple of chestnuts from its earliest albums — the winking biblical allegory “Adam’s Apple,” the wailing Brad Whitford showcase “Last Child” — and massive ’90s hits like the harmonica-laden “Cryin’” and the schmaltz-covered power ballad “I Don’t Want to Miss a Thing.” Lead guitarist Joe Perry took over vocal duties on two Fleetwood Mac covers, including the locomotive “Oh Well,” while Tyler was in full-on rock-god mode, ribbing his bandmates, mugging for hoisted smartphones, and enthusing about the charms of playing outside. For the encore, the band pulled out its big guns: Tyler got behind the piano for the anthem “Dream On,” and a fiery “Walk This Way,” with the help of fog machines, closed out the day. Saturday’s performance is the only Aerosmith show on the docket for 2018. Perry, having launched his recent solo album, “Sweetzerland Manifesto,” with a handful of shows (including an April gig at House of Blues) with Whitford, is heading out on tour with Hollywood Vampires, his project with Alice Cooper and Johnny Depp, later this month. Tyler and his Nashville-based Loving Mary Band will hit the road with the songs from his 2016 country-leaning CD “We’re All Somebody From Somewhere.” But Saturday’s set, with material from Aerosmith’s Allston days through to its ’90s superstardom, showed that the band remains a well-oiled machine.